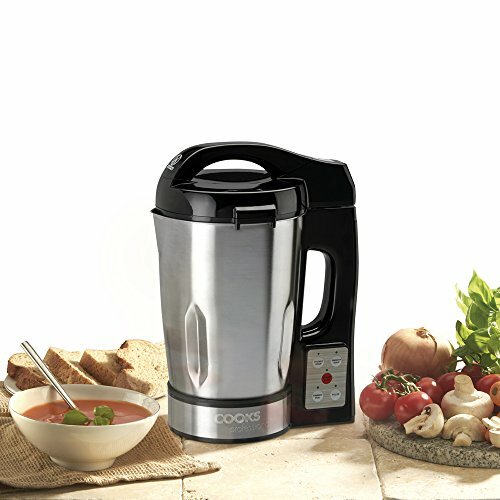 Welcome to Soup Maker Reviews, where you’ll get the lowdown on the most impressive machines for soup lovers everywhere. Below, you’ll find our favourite models of soup maker, sometimes referred to as soup cookers, mixers or machines, and learn about what they’ve got to offer to make them so highly rated. We’ve also been working hard to put together an extensive collection of detailed soup maker reviews too, along with the all important information and FAQs to help you make an informed choice. 3.1.1 Why Buy A Morphy Richards Soup Maker? 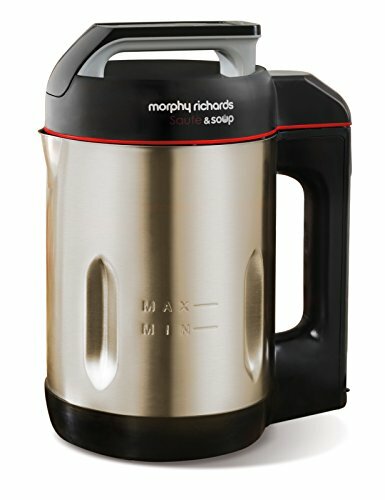 3.1.2 What’s The Difference Between Morphy Richards Soup Makers? 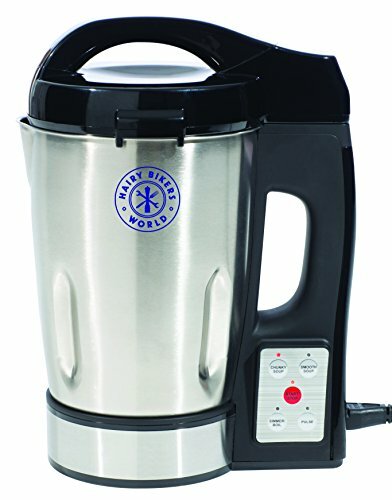 4 Should I Buy A Cheap Soup Maker Or A Premium Soup Maker? 4.1 What’s The Cheapest Soup Maker? 4.2 What’s The Smallest Soup Maker? Here’s our latest top 10 soup makers table. We’ve ranked them based on value for money, so you can compare soup makers to get the biggest bang for your buck! Alongside each model there’s a blue button to check the current Amazon price. Check these out, as there’s very often sales and deals on soup makers, so if you see a great price, be sure not to miss out! So, you’ve seen our top recommendations, but as you’re still here reading this, you’re probably after a bit more information. That’s perfectly understandable, as soup makers are a relatively new item in kitchens in the UK, certainly being far more popular than they were a few years ago! Just below, you’ll find a lot more information in our mini review section about our favourite models, giving you a simple overview about why they’re so good. For those of you that really want to get into the nitty-gritty detail, you can see full, no holds barred reviews where we blend (excuse the gratuitous pun) out the finer points of each of our selected products. Let’s kick off with our favourite soup maker, the Morphy Richards 48822. We really like this model because of how much it delivers for a relatively low price tag. Granted, it’s not the cheapest of the cheap, but it does offer very impressive all round performance for around half the price of the more expensive soup makers we feature. As with many kitchen gadgets, like steamers, kettles and toasters, you might find yourself feeling tempted to opt for the cheapest item you can find to do the job. After all, a kettle is a kettle isn’t it? How many ways are there to make water hot? Well, what you’re often missing with that argument is the build quality of the appliance, and crucially how long it’s likely to last. The same applies here. While you can pick up a very cheap soup maker, in the range of £30-£50, you’re probably not going to get the quality of results you really want. After all, many people invest in making their own soup as a healthy alternative to other meals, and so that they’ve got something to enjoy at lunch time that’s a bit more exciting than a couple of bits of bread and a slice of ham – if you get a poor quality soup, the motivation to eat fresh soup probably won’t last. So, in a roundabout way, what we’re highlighting here is the reason why the 48822 soup maker’s UK price has dragged a good, solid machine up to our top spot – it’s not going to cost much more than a budget machine, but performs like a mid range maker. 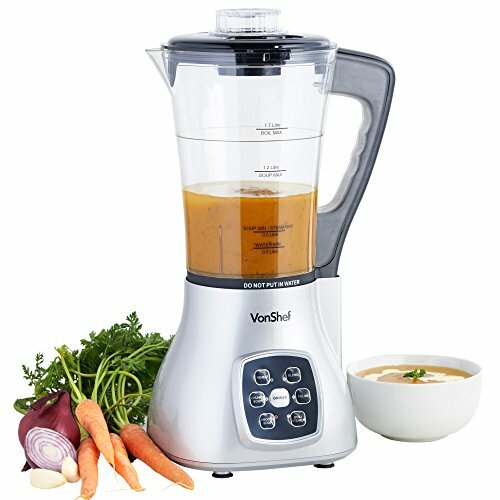 For newbies to soup making and those looking to replace their machine alike, this will appeal to both. If you aren’t familiar with these products, perhaps we should take a moment to explain them, as they virtually all work the same way – the difference is in how well they perform. As a rule, you place all of the ingredients for your soup into the chamber, much like you’d fill a kettle with water. You’ve then got an array of settings you can use (some offer automated ‘programmes’) such as chunky soup versus smooth soup and temperature selections. The 48822 offers four levels of coarseness in operation, with the common two (smooth and chunky) plus a juicing and blending setting. Typically, expect soups to take just over twenty minutes to complete, and if you leave the lid on they tend to remain at an acceptable temperature to serve for up to fifteen minutes. As this maker is backed by a two year warranty from registration, you’re covered by Morphy Richards’ confidence in their product for an extended period after purchase. Next up,we’ve got a soup maker from Tefal to look at, the BL841140. Appearance wise, it looks a bit more dated than some of the other soup makers that we’ve featured in our reviews, but don’t let looks deceive you! One of the great functions that the Tefal BL841140 offers that’s missing on some of the alternatives is a ‘keep warm’ setting that means you can delay serving for up to two hours after the soup has been made. That could be a huge bonus to households that suffer from frequent interruptions, perhaps if you’ve got small children that need attention. As many soup makers can take up to half an hour to complete their soup making cycles, for some people it’s hard to know if you’re going to be free to sit down and eat in 30 minutes time! There’s then controls for the additional easy clean and keep warm functions – hopefully they’re self explanatory! Size wise, this unit is roughly the size of a large electric kettle, so fits comfortably on the worktop space in the kitchen without taking up too much valuable room. That’s an important takeaway point if you’ve already got a lot of gadgets in the kitchen, or space is limited. 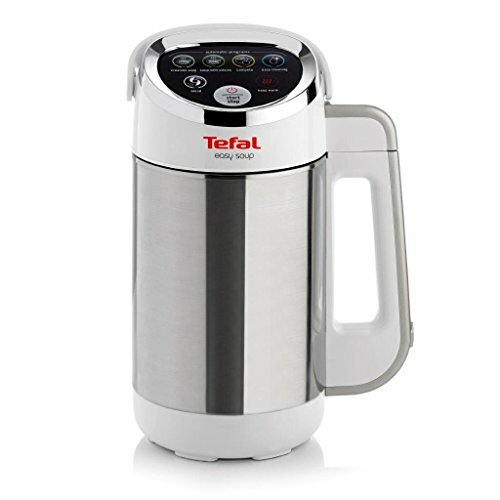 Its design is also similar to other products in the Tefal range, so if you’ve already got a similar kettle from the same brand it will fit in nicely if you like things to look just right. The blend function is a nice feature in this model, the included instruction and recipe book will give you plenty of ideas about the sort of ingredients you might like to use, but before long if you’re like us you’ll build up the confidence to experiment with different shakes and smoothie ideas. There’s more information for you in our Tefal BL841140 review. The VonShef 800W soup maker brings us a high quality soup maker for a very affordable price. At the time of writing, the VonShef is one on the cheapest models that have made it to our top ten, and at the same time offers on of the highest capacities, meaning that you can make more soup per cycle. 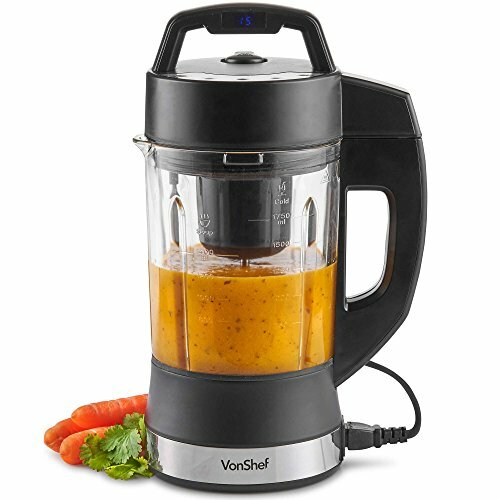 With a fast programme of 25 minutes available, it won’t take the VonShef long to turn your chopped veg into the soup of your choosing, whether that’s a smooth or a chunky meal. That 1.6 litre capacity means that you’re able to serve up to six standard portions at once, or cater for four people if you’re like me and enjoy a generous helping! The VonShef manages to keep the soup warm for much longer than some other models too, even after an hour it’s still warm enough to enjoy. While you get a good soup maker for your investment with this model, it does lack a few features that you’ll find on other soup makers, such as a reheat function, and a long blending option. You can pulse blend ingredients, but it’s not quite the same. One of the big draws for people buying soup makers is that they know exactly what they’re eating. For some, canned soups can taste quite processed, whereas the do it yourself nature of soup making means you can make exactly what you want, and create very pure, healthy soups with nothing you don’t want (or like!) added in. Sometimes is takes a while to get used to the taste of homemade soups, but before long, the VonShef 800W soup maker can offer you a low cost, extremely healthy way to make lunch fast! 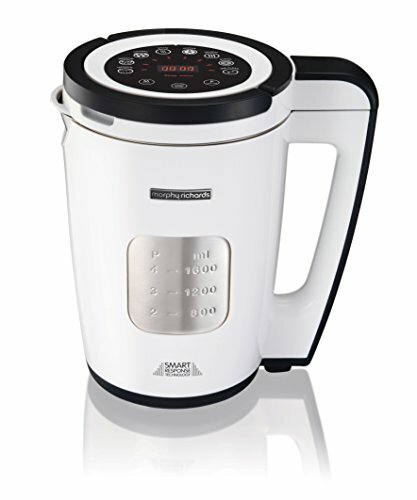 Like the impressive 48822, the 501016 is a popular and high performing soup maker from Morphy Richards. Like the previous Morphy Richards and the VonShef, it’s got a good 1600ml capacity, so six standard servings or four generous bowls are comfortably produced in one go. It’s also got the standard functions for smooth or chunky soup as you’d expect, along with the blend and juice functions (which were lacking in the VonShef soup maker). Nice added extras on the 501016 include a timer to keep you informed how long it’s going to be before the soup is ready (think of this as an estimate rather than a precise timer) and being a very easy to clean unit – particularly good as soup makers often have a habit of suffering from ingredients getting stuck to the elements and even burning on. If you’re disciplined about cleaning after use, a rinse and wipe with a cloth followed by a second rinse is all this soup maker should need. Let’s be honest here, we didn’t expect much from the Hairy Biker’s branded soup maker. That’s not to say we’re not big fans of two of the most unlikely TV chefs on the planet, we very much are (mate). It’s just that all too often, products get the celebrity treatment more as a result of a big sponsorship pay cheque than a genuine endorsement of the rebadged product that they’re promoting. In this case, though, we were very pleasantly surprised. It’s certainly not one to rival the most impressive Morphy Richards or Tefal models, but if you’re looking for something a little different, and like a novelty angle or just love those two bearded national heroes, this might appeal to you. Notably, you also get a cleaning brush in the box with this model, a nice extra on the face of it, but it does also mean that cleaning in general isn’t quite as easy as the easy-clean Morphy Richards products above, hence the need for the brush! The next product in our table is the 5014014 from Morphy Richards. 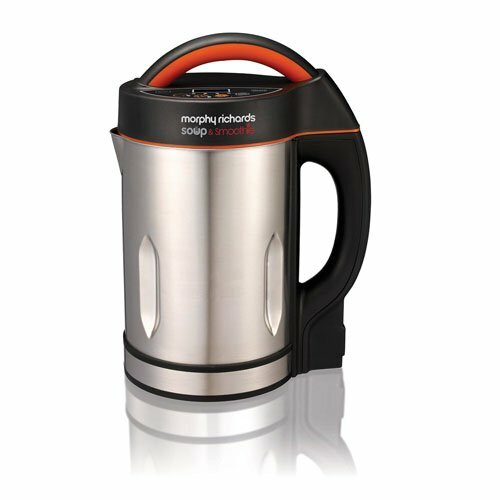 At first glance, it looks very similar to the earlier products in the Morphy Richards range, but there are a few important differences. The fact that this ranks lower should also give a clue to the fact that we think the earlier choices will be better for the majority of our readers. The big plus for this model is that its a saute maker as well as a soup maker. I was a bit confused as to the why’s and how’s of this when I first came across a combined soup and saute maker, so it’s worth explaining how it works, and what it’s for! In these types of soup maker, the base of the inside of the chamber can heat up so that you can cook ingredients before making soups. This opens up a much wider range of varieties of soup, particularly allowing things like bacon to be included without needing to precook it under the grill or on the hob. With a standard soup maker, you shouldn’t use uncooked meat unless the instructions tell you otherwise, as the temperature may not get high enough to fully cook them. Another small but useful feature is the ability to pause the programmes, so for example if you wish to add ingredients or flavouring (eg salt and pepper) part way through, you can do so without causing the cycle to start again from the beginning. All in all this is another impressive Morphy Richards soup maker, and one for meaty soup fans. Taking a step away from the big, well known brands again, this is the Cooks Professional soup maker. It’s another affordable option to consider alongside the VonShef for people on a tight budget looking to buy a good soup maker. As you would probably guess, the lower price tag does mean a slight compromise in features, with the main one being a smaller than average 1200ml capacity for soup making. In terms of what you can make though, this soup maker stands next to the best of them, able to handle smoothies and shakes as well as the soups you’d expect from a modern machine. The Cooks Professional soup maker even comes complete with a recipe book to help you get started straight away, although the fun of experimentation with ingredients will almost certainly take over very quickly! Like the earlier VonShef 800W, this machine is another from the brand that offers exceptional value. It feels more of a combined blender and soup maker which will appeal to some, especially if you have limited kitchen space or are on a tight budget and want both a blender and a soup maker. While this model is very cheap, it does feel that it’s lacking in the sense that it’s not really an expert in soup creation. In the same way that you can buy microwaves that double up as grills, they never seem to quite do the job as well as you’d hope. If you’re on a tight budget and can’t stretch to the better models above, this is a better option than nothing, and is certainly capable of creating a good soup, however it’s let down by just falling short in too many areas (for example the build quality feels fragile compared to other models). 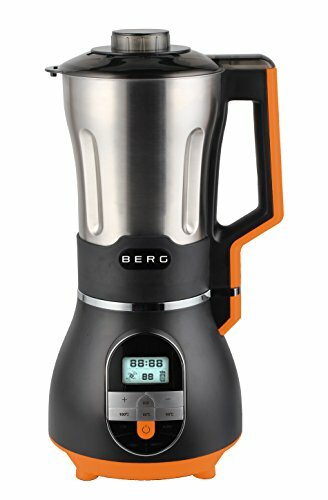 BERG probably isn’t the first soup maker brand you’d think of when considering what to buy, but the relative unknown in the market has managed to put together a fairly appealing soup maker that looks really good on the kitchen worktop. If you like your kitchen gadgets to look the part, then this may well be a great choice, however what it gains in the appearance stakes, it does lack a little in functionality compared to high ranking alternatives. Like the VonShef immediately before this, it’s a multi function machine rather than a dedicated soup maker, but BERG have managed the combo much better than VonShef. As a soup maker it does a good job, whether you’re a smooth or chunky soup fan you’ll get great results. It’s also a versatile multi speed blender too, and what’s more offers a heating mode to simply heat up soup – a common complaint as a lacking feature in some other models. So, why doesn’t the BERG rank higher? In terms of manufacturer, we’re finishing out top ten soup makers where we started, with the Morphy Richards 501020. Like the BERG, this is another product at the more expensive range of our top ten, but it does include a lot more bells and whistles that you won’t find on cheaper models, particularly those aimed at people new to soup making. In particular, this model is aimed at those who struggle to confidently cook meals, whether that’s for themselves or for family and friends. It’s designed to minimise waste, helping you to make the correct amount of soup when you tell the maker how many you’re cooking for. Cleaning is also straightforward, as you can simply use soapy water with the built in cleaning functions to do the heavy lifting to remove the debris after use. At first glance out of the box, the control panel on top of the Morphy Richards 501020 lid looks more complicated than some other models, including those from the same brand. After a little use though, it’s a very intuitive, almost one touch operation to use each feature. There are some UK brands that you’ll come across time and time again (and you’ll have seen above), and others that are a little less common. In case you’re looking for a more unusual manufacturer, let’s take a look at the wider range of soup maker brands. Let’s start with one of the more obvious brands, and one that’s got plenty of coverage here on SoupMakerReviews.com. Morphy Richards have created quite a number of different models, ranging from the budget (but impressive) models like our long term favourite the 48822, to more adventurous models like the popular sauté-ing 501014 soup and sauté machine. As they’re such a heavyweight in home soupmakers, they’ve got their own section here. Why Buy A Morphy Richards Soup Maker? As one of, if not the, most experienced manufacturers, Morphy Richards soup makers tend to have the simple benefit of being easy to use right out of the box – in other words, they just work! OK, the 48822 we mentioned a moment ago might be getting a bit long in the tooth, but it’s still incredibly popular and let’s face it, soup is soup, there’s not a great deal to evolve really. If you’re new to home soup makers, Morphy Richards’ models are going to be a very appealing choice, as they give you a really easy introduction. You can focus more on ingredients and recipes, knowing that it’s not going to be the soup maker machine itself that trips you up if your soup goes a bit wrong. It’s not as if you’re spending hundreds of pounds, so there’s nothing to stop you progressing on to a more advanced soup making blender model later if you so wish. What’s The Difference Between Morphy Richards Soup Makers? It’s a surprisingly difficult question to get answered by researching on the web, so we thought we’d address it here as simply as possible. Our top choice, the 48822, is actually a fairly old model, but it’s really reliable, really easy to use and really popular, and that’s a big part of why it’s held on to our top spot for such a long time. 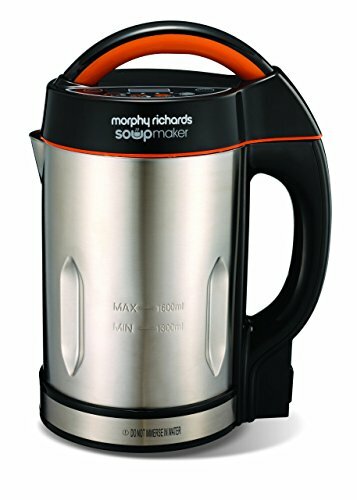 Since Morphy Richards released that, over a number of years, they’ve released several different versions of it, mainly with slight modifications to the design (particularly around the lid), and a slightly varied set of features. For example, there’s the saute version that you can find here. Unless you’re really liking the look of one of those variations, we’re still recommending the 48822 to this day – it’s number one for a reason! Another well known kitchen appliance brand is Tefal, who are also recognised for items like saucepans and frying pans. As a kitchen specialist, it’s little wonder Tefal have managed to produce a strong soup maker in the form of the BL841140. While they’re not producing a range as extensive as Morphy Richards, they are worth a look, especially if you have other Tefal products and like everything in your kitchen to look good together. Our Tefal section is here. Vonshef are one of the lesser known brands that we’ve featured on the site, and rightfully earn their place thanks to their low pricing strategy. A great example is their 800W soup maker, reviewed here. Their products tend to appeal to newcomers to a particular market, in our case soup making, or alternatively those with limited budgets who are still wanting to improve on their current kitchen range. The Vonshef reviews can be found here. Once famed more for cars than kitchen appliances, their automotive sell off to Chevrolet means that you’re now more likely to see the name of this South Korean manufacturer on your worktops than on the road. They’re well known for creating simple and easy to use products, and that experience has now found it’s way into the soup maker arena. Should I Buy A Cheap Soup Maker Or A Premium Soup Maker? OK, we admit it, that’s a loaded question that we made up ourselves, to encompass a wide range of questions that have been either emailed in, people have asked us or we’ve stumbled across on the web from time to time. The reason we’re addressing it though, is that it’s not really the sort of question that’s able to be answered on a website like this, as it’s not something that can be answered with a one size fits all approach. In fact, that’s why we built our table of best soup maker reviews above, to let you compare the soup maker machines more easily. So, let’s start this section by trying to answer the most common questions we get. What’s The Cheapest Soup Maker? Firstly, here’s the question I cringe at. If you really want to find the cheapest possible model, head to the local market, or explore the depths of eBay. You’ll certainly find something cheaper than what we’re linking to on Amazon if you look hard enough, but it’s not something I’d recommend. I think what people really mean is what’s the cheapest soup maker that it’s sensible to buy. The answer I give to that is generally to have a look at our top ten above and compare the prices using the links provided. Prices change over time, so I can’t even tell you which is cheapest at the time you’re reading this as they’ll likely have changed since I wrote this! What I can tell you though, is they’re all worth buying in the top 10, and the higher they are, the better value I believe you’ll get. What’s The Smallest Soup Maker? It’s not something we get asked very often, but it’s come up more than once. The size of soup makers are all remarkably similar, so it’s unlikely to make much difference. As a rule of thumb, you can work on the principle that the smallest machines will be the ones with the smallest capacity. In other words, if a particular soup maker has a maximum capacity of two litres, then it’s almost certainly larger than one that has a maximum of 1600ml. It’s not linear, so 2 litres doesn’t mean twice the size of a 1 litre model, but there’s a simple guideline to help you narrow down towards something that will be easiest to fit into the kitchen cupboard or be least intrusive on the worktops. You’ll often see other makes advertised, some of which are simply re-badged versions of branded versions (including those above). Discount supermarkets also stock them from time to time, so don’t be surprised to see a Lidl soup maker or Aldi soup maker on a future visit. If you’re wondering whether they’re actually the same as a more well known model just compare the image on our review page to one in the store – all too often when a re-badged model comes out, it really is as simple as the removal of the manufacturer’s logo and it’s replaced with another name! In this case, it’s not that you’re buying, for example, a Wilko soup maker, but you may well be getting a great price on one that sells for a lot more with it’s ‘real’ brand attached! Beware though, not all soup makers are created equal. Some are soup mixers in a blender sense, which cut and dice up ingredients as part of their programmes, whereas others simply heat up your soups. Obviously, if you’re looking for a machine that makes the job a lot easier, you want to be getting one that’s an all in one solution, rather than having to prepare the vegetables and/or meat more than necessary before they’re loaded into the soup kettle. How Does A Soup Maker Work? soupmakerreviews.com is a participant in the Amazon EU Associates Programme, an affiliate advertising programme designed to provide a means for sites to earn advertising fees by advertising and linking to Amazon.co.uk.